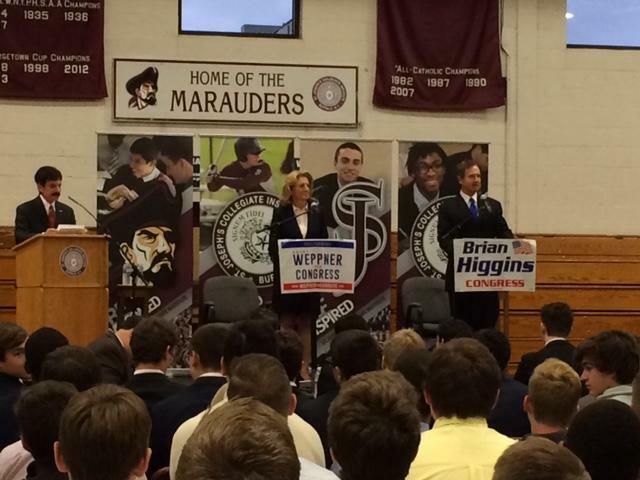 A debate between Democrat incumbent Rep. Brian Higgins and Republican challenger Kathy Weppner took place at St. Joseph’s Collegiate Institute Wednesday morning. The candidates are vying for the 26th Congressional District seat. The full debate between Democrat incumbent Rep.Brian Higgins and Republican candidate Kathy Weppner at St. Joseph's Collegiate Institute. The matchup is expected to be the only debate the two will engage in before Election Day. The topics of discussion during the forum included second amendment rights, whether to put a Buffalo Bills stadium downtown, the Affordable Care Act, safety in public buildings, how the U.S. should handle ISIL, medical marijuana, Common Core, minimum wage, U.S. torture techniques, and the Ebola quarantine. Higgins said he believes the Center for Disease Control and Prevention should be responsible for advising the public on how to handle the Ebola issue. St. Joseph's Collegiate Institute teacher Ted Lina, Republican candidate Kathy Weppner and Democrat incumbent Rep. Brian Higgins. “Listening less to the political folks and listening more to the public health community is probably in our best interest in respect to this,” said Higgins. Weppner said she believes mandatory quarantines should be implemented. “The CDC has spent 6% of its $3 billion over the last few years on silly studies instead of on infectious diseases. We’ve been squandering the money that we do have. So I believe, yes, there should be a quarantine. They’re quarantining our soldiers in Germany for 21 days,” said Weppner. “If there are medicinal purposes that medical marijuana can be used for then we need to study it. We wouldn’t put a medicine on the market without studying it. If there are properties that help seizure disorders then we need to study what properties those are and put it into a little inhaler. We can’t open pot stores. We need clear thinking young people to attack the problems we have. Not people that are going to sit back with a bag of Doritos and watch television,” said Weppner. Higgins said health professionals should be in charge of deciding if marijuana is a good treatment option. “If there are people out there suffering and medicinal use of marijuana can help then that should certainly be considered,” said Higgins. When asked about a minimum wage hike, Higgins says he believes minimum wage should be raised. “What that would do is create more demand in the economy. When people have money they spend it. When people buy things, people make things. When people make things, people work. When people work they’re productive. So, I believe that an increase in minimum wage will be helpful to the economic growth in this country,” said Higgins. But Weppner said a minimum wage increase will hurt the poor the most and cut millions of jobs. “If you just say everybody gets $30 an hour, what does it do to a person that’s currently making $20 per hour and has been at his job several years? Wages have to go up with market forces or it doesn’t work,” said Weppner. The debate was also heavily focused on second amendment rights. Weppner said she carries a gun every day and she feels federal officials should be allowed to carry. “I’m not carrying now because I’m in a school,” said Weppner. Higgins said he supports the right to bear arms, but believes there should be background checks for those who carry. 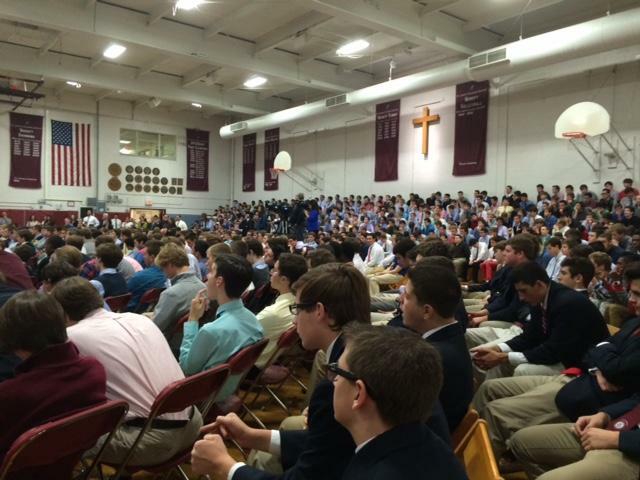 St. Joe's has been hosting political debates for more than 25 years. The debate was moderated by government teacher Ted Lina.